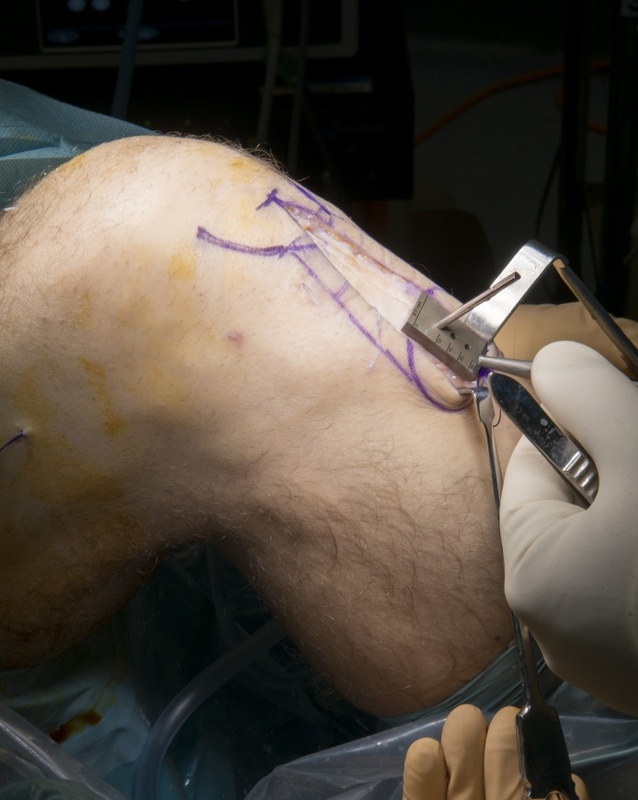 Learn the Patella tendon harvest for ACL reconstruction surgical technique with step by step instructions on OrthOracle. Our e-learning platform contains high resolution images and a certified CME of the Patella tendon harvest for ACL reconstruction surgical procedure. The ideal graft for ACL reconstruction should be widely available and easily procured. It should have mechanical properties equal to those of the native ligament and it should allow secure fixation to enable aggressive rehabilitation. It should also incorporate rapidly and have limited donor site mobility. It should have a low probability for disease transmission or immune rejection. It should also be inexpensive. The ideal graft does not exist with all grafts requiring degrees of compromise. Without doubt hamstring autograft has become the most popular ACL graft globally over the last 10years for a number of reasons. It is easier to harvest through small cosmetic scar and lends itself to “all inside” techniques. ACL reconstruction with bone patella bone(BTB) still has a significant role and is particularly favoured in elite athletes as well as for revision surgery. The bone blocks allow for more aggressive early rehabilitation suiting the elite athlete with a lower rerupture rate in this population reported. A recent study by Gabler et al in the American Journal of Sports Medicine has shown that the rupture rate for BTB in anatomic ACL to be comparative to hamstring. BTP knees had a greater incidence of anterior knee pain and crepitus, where there was a tendency towards increase laxity within the hamstring group. Clinical outcomes showed no differences. The long-term outcome of bone patella bone ACL reconstruction has been reported by Pinczewski. 90 BTP ACLs were reviewed at 20 years post-surgery. A 9% failure rate was reported on the index limb with a 30% rupture rate on the contralateral limb. Knee pain was present in 63%. Female patients although had a lower failure rate, they reported poorer IKDC scores had more activity-related pain and were less likely to participate in strenuous activities compared to males. Thus, bone patella bone may well have more significant donor site mobility long term than hamstring tendon in females. Institution :The Royal Orthopaedic Hospital, Birmingham ,UK.